It's no secret that Paper Mario: Sticker Star wasn't the best received Paper Mario game to date. Taking a different approach to the established and much-beloved RPG system, Sticker Star came under fire for the somewhat removal of experience points and stats, necessity of using "Thing" stickers to progress further, and somewhat soulless presentation by replacing original characters with more Toads. One would think that Nintendo would've heard this response and acted on it prior to announcing the next Paper Mario game, yet Paper Mario: Color Splash looks like a direct continuation of Sticker Star from a gameplay perspective. It's not all bad, though. Kotaku recently caught up with Risa Tabata -- a producer at Nintendo -- at E3 and pressed her for answers on what this new entry will bring to the table. Contrary to popular belief, it seems that Nintendo did hear the criticism against its predecessor, and is working to get it right this time. For one thing, the story is supposedly improved, focusing a bit more on mystery and the relationship between Mario and Huey, the game's companion character. This time we have–I don't know if I want to say a proper story–but we have a story (laughs). It starts from kind of mysterious opening.. You're not sure what is going on, and as you go through the story, you'll realize, oh this is what happens. And there's a lot of interesting stuff that happens with you and Huey. On top of this, she also spoke about how you can carry up to 99 cards in your inventory this time around, and how there will be a hint system in place to make it easier to figure out where to go and what to do next, hopefully to get around those issues in Sticker Star where progress was halted because you didn't have the right "Thing" sticker in your inventory. What do you think? Are you looking forward to Color Splash? Do you think it'll properly rectify the issues of its predecessor? Drop us a comment in the section below. IT'S BETTER THAN NOTHING, AMIRITE? 99 cards is probably plenty, but there still needs to be something in place so that you can't just run out of attacks. Also, the quote about the story doesn't actually say anything other than you'll figure out what's happening as you play the game... That's usually how stories work. Hints won't stop back-tracking. If you don't have the right card, any hints you get won't change that. You'll still have to go back to find it. Also, still don't have high hopes for the story, given how hesitant she was to call it "a proper story". Also, funny how Nintendo supposedly listened to criticisms, yet all we've seen so far for characters are Toads. Can't get any worse than sticker star. Only the second time in my life I was completely let down by a Nintendo game. The first time was Urban Champion. Honestly, that doesn't sound like enough of a departure from Sticker Star's formula to convince me to buy this game. Greater inventory limit and a more interesting secondary character are steps in the right direction, but the lack of other interesting characters, incentive to engage in combat, remotely interesting plot, (unless the "mystery" is actually good, which I doubt,) and overwhelming linearity are the biggest problem with the original that seem to carry over to this game. Sticker star wasn't nearly as bad as people made it out to be. This game looks really good IMO. Oh, Nintendo. Finally blowing it enough for me to end this 20-year relationship I have with you. I don't want to still sound bitter about Color Splash, but man, I probably would've preferred no game at all than a successor to Sticker Star. @UberMadman What really bugs me is that Nintendo apparently listened to criticism...except for the lack of original characters, and the battle system sucking, and the lack of partners, and the lack of story (Let's be honest: the twist is that Bowser is the baddy. That's all it's gonna amount to. ), and the world map making progression more linear, and bosses requiring a specific sticker, and the back-tracking. Emphasis on the back-tracking, because they seem to be trying to fix that...they're just not giving a damn with their solution. As I said earlier, throwing in hints won't just make the card you need magically appear. You'll still need to go fetch it. Also, wanna know something funny? In Sticker Star, you could carry up to 120 regular-sized stickers, so the amount you have here is actually LESS-THAN the amount in the last game! @EXP Gonna have to agree with you on that. In fact, I would much rather prefer that the series just ended with Super. At least then it would've been able to end with some dignity! Edit: In b4 people start calling me "whiny", and "entitled", and that I'm "against change". This game really looks good. Honestly, I don't care about a story in a Mario game, gameplay is my main thing. 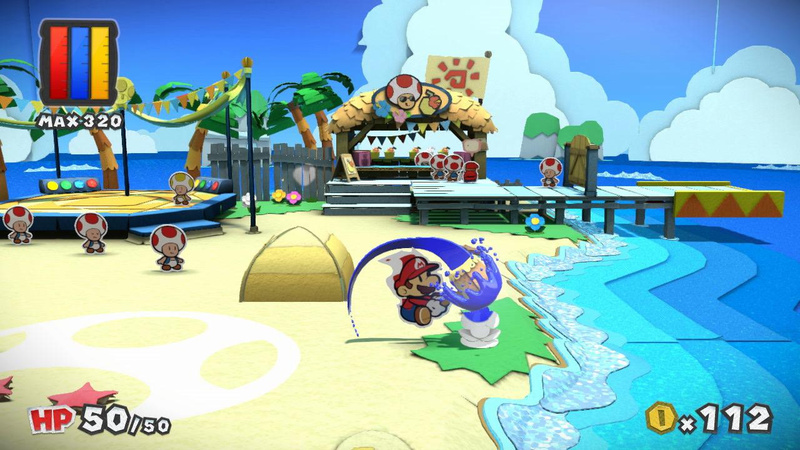 In my opinion, this looks tons better than any Paper Mario game I've ever played, and I'm not just talking about the HD graphics. At least I still have the Thousand Year Door to look forward to. If I haven't played it, it's new to me. At least it's not Super Paper Mario, the darkest theme for Paper Mario franchises ( World of Nothing, River Twigz Bed, Underwhere are really SPOOKY thing ever) . Well, the Toads is too many and kinda boring too see them again and again. The THING or i called it 'SUMMON' looks really ROFL to watch. They need to redesign the Cards pattern because so far looks too bland. Sticker Star has very holographic sticker design when you tilt your 3DS. Super Paper Mario is still my all time favorite. i have some hope this will be a fun paper mario game. if people miss the more rpg feel of the original and 1000 year door you are free to play those games. @Snow-Dust i'll never understand what he was thinking with that one....getting weirder and weirder in his old age....wasn't it his idea to not make a new story for star fox zero too??? @Uncensored nah, he wanted a new story and infact, an interview had him saying in Zero, the story will make the player think is Andross truly bad and is Pepper really the father figure he made himself to be and a bunch of shenanigans. Sounds terrible, even worse is that it's $60. Will wait to see reviews on this one. I thought Sticker Star was decent. Definitely not the best game I've ever played, but definitely not the worst game ever made. In the end I enjoyed it. As such I'm willing to give Color Splash a shot. From what I've seen it does look better than Sticker Star in certain aspects. I do look forward to playing it. I think it's good to see these improvements and I'm still getting the game, but I ain't jumping in praise just yet. Better hint system and 99 Cards (although Sticker Star gave you enough room for 120 spaces of stickers, you kind of have to account for the space that the larger stickers take up), though I have yet to see how this game's story ends up being. @UberMadman Color Splash has a Hammer pickup, which is dropped by defeated enemies in battles. Picking it up will fill up a gauge next to the Paint Gauge by a sliver and by picking up enough of those Hammer Pickups, your Paint Gauge Capacity will be increased. You also gain Enemy Cards from defeated enemies after battles, each which fights for you automatically during turns and even guards Mario. Sticker star wasn't great, and this game seems a bit better. It seems like both games are ridiculously random. @NintendoFan64 They are just getting away from the RPG formula because the Mario and Luigi series will be the one to hold such genre. Which is idiotic but this is modern Nintendo to you. There's simply nothing I'm excited for with this one. I may get it but probably not anytime soon. @UberMadman I've never come across another rpg style game where you are far better to avoid combat because you waste your limited attacks for no real gain. It's the total opposite to previous Paper Mario titles where you have attacks you can level up. Honestly Sticker Star had zero incentive to fight so halfway thru it became a glorified walking simulator. Seems you get a little something for your trouble for fights in Color Splash but once again there isn't a huge reason to battle. If they were going to make the battles basically worthless I would've preferred a return to Super Paper Mario style side scrolling so I can just attack enemies on the fly if I so choose. I feel Nintendo has been slowly killing off the story in Mario RPGs. Dream Team was the start as it had ridiculous amounts of backtracking (even for Mario and Luigi standards) and Paper Jam proceeded to remove all unique characters and gave us the regulars. Color Slash has even less than that. Hell, I'll settle for a shy guy in a clown outfit. Don't buy the whole "You'll know who the character is by their personality" tripe either. The amount of effort into that retort is the same amount of effort put into this game. I'm not mad the game isn't like the original Paper Mario, I'm mad the game looks half-assed and boring. 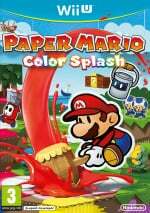 Paper Mario could take place in any number of genres and be decent if effort was applied, of which color splash has none. @Kmno Don't even get me friggin' started on how stupid that is! You mean to tell me that they're fine with having so many platformers, yet Nintendo can't handle having two Mario rpgs!? And not only that, but two Mario rpgs that are actually very different from eachother!? Funny how they managed to co-exist with Super Star Saga and Thousand Year Door being released only a year apart from each-other! That still doesn't address the issue of the monotonous and unnecessary combat the series now has. Blows a raspberry and thumbs down exaggeratedly RIP Paper Mario. The Sticker Star legacy killed the series. I don't think Sticker Star was THAT bad, but it definitely didn't hit the heights of the first or second games. I might end up getting this, but it seems like Nintendo still hasn't learned. The funny thing is, the whole idea that Mario only needs one RPG series makes no sense, considering they released New Super Mario Bros U, Donkey Kong Country: Tropical Freeze and Yoshi's Wooly World, three different 2D platformers all on the Wii U alone. @Kmno ugh... While I love Mario & Luigi, if I had to pick one I'd so choose Paper Mario to be their main RPG line, TTYD was... Well, it was so much more than just a Mario RPG, it was more like having the Mario characters find themselves in an RPG, and it was so right, it didn't feel forced. Don't get me wrong, M&L are excellent games too (though the recent one was meh). It may be an improvement on Sticker Star but it's a disaster by comparison to Thousand year door. @mozzy1 Yeah, I think the hate for the current Paper Mario trend is less because of what it is and more because of what it's not. After the likes of TTYD, that's primarly what that group of Paper Mario fans want now. And the harder Nintendo strays away from that demand (no matter how good these new Paper Marios might be), the more those fans are gonna resent Nintendo. You know what? Fine. If this is their attempt at doing SS right, go ahead. I really just hope this is just them trying to find closure from the SS response, and go back to the traditional formula after this. If this really is SS done right, this could be a fun game in it's own right. @JpGamerGuy90 Dream Team had some problems, but the story was fine. The idea of going into Luigi's nightmares was really cool. And it had lots of characters and races from the M&L series! "Tanabe: Yeah. With regard to the story, we did a survey over the Super Paper Mario game in Club Nintendo, and not even 1% said the story was interesting. A lot of people said that the Flip move for switching between the 3D and 2D dimensions was fun." If you think about Super Paper Mario, it probably wasn't the best type of game to include an RPG-heavy dialog in. But if you worked that plot-heavy story into a traditional RPG, it might've been better received. For some reason, Nintendo has been getting this impression that story/characters have been a problem in recent games, just because the story doesn't gel well with other elements in their games. Maybe they just made a bad game. Dream Team was slow. But stripping all of the characters, spirit, and arguably the story in M&L for its Paper Jam sequel was as big a mistake as it was for PM: Sticker Star. @Aerona You won't be disappointed. I will be getting this game, simply because even a dull spark of resemblance to the original or TTYD is enough for me. Wow this sounds less and less of an RPG, why don't they just give us 99 of each card at the beginning and put this dying franchise into the ground. It's like Nintendo wants to stop printing cash. @NintendoFan64 sometimes I'm flabbergasted at what I percieve is incompetence of them, I mean it's either that or they are just insane. But it is them words and I have a feeling Miyamoto had a hand in this. The guy is a legend and will always be but his best days are definitely behind him. @ShadJV and I wholly agree, hell most fans agree and I haven't seen anywhere that there is confusion about having to different series of the same genre and franchise. But here we are. "if not broken, do not fix it"
oh well, the classic question between fans and productors. For me (and I also learned a game that changed drastically), it is better enjoy the games that complaining; and in the end, really, if the game is good or not, that's "personal opinion of each person"
I don't hate Sticker Star, but it has some glaring flaws. However, I could stand the gameplay, the shallow writing is what puts it down for me. I may sound like an entitled fanboy here, but I miss the days when Nintendo was willing to allow Darker Themes into the Mario franchise. PiT scared me when I was a kid. Or how about some specifically dark scenes from Super Paper Mario? Like going to an 'E Rated' version of hades, a villain that gains followers either through false promises or you get hypnotised, OR what about that false ending where Dimento plants sprouts on both Mario's and Luigi's head and then orders them to kill Bleck... only to then be followed by a game over screen? Now? I've gotten more out of Rosalina's storybook compared to any recent Mario RPG. I wonder if there will be amiibo cards for this game? Could make sense. As I've grown up I tend to dread talking to NPCs and dealing with all the dialogue in RPGs when I really just want to game. As a result I end up over leveled and bored (gameplay-wise) in about every RPG I play, even though I adore the genre. This is why stories are so important to RPG games, but it doesn't have to be that way, those are often a crutch for an otherwise poor game. I respect that Nintendo's teams are always reexamining genres and gameplay functions to forge a new path. Reminds me of a quote I'll never forget about Muhammad Ali: "he didn't grow up like you or I, instead he evolved... He was a kid with these crazy notions and he never moved on, he just kept reexamining those ideas and adapting..."
There are literally 7 of the same exact toad in that one screenshot and 1 colour swapped one. @NintendoFan64 man, Eggman can move! I honestly think Nintendo is suffering of old age within it's rank to the border of senile. Comments like these really make me cringe and worry about what the NX is going to turn out to be. All these old so called legendary designers had their prime time long ago and need to start making room for new "young" talent to actually bring in new and fresh ideas. When you start stripping established franchises of core functionality and features and call that improving and fresh new ideas....... well I don't know how to put it..... but then I think it's time to step up and retire. Sticker Star is a great game. It is different than other paper mario games but that is also true concerning Super Paper Mario. Collecting "thing" stickers has never been an issue when you don't rush through the levels. And backtracking. - well there is backtracking in Zelda games or a bunch of other games and people do not complain. Heck, nost Rpg games have backtracking - and people here who want color splash be more rpg-ish are now complaining. Give color splash a chance - it looks awesome. If you don't like i than that is fine but don't ruin the game for others! I'm too tired for all this anger at video games. Let it release. Let me play it. I'll decide for myself whether it's a good game or not. @EXP Yeah i would rather not have at all than a Paper Mario Sticker Star 2 as well. I'll probably buy it because the graphics are absolutely stunning, but that 'I don't want to say a proper story...but it has a story' worries me to no end. Loads of people say they prefer new games, but honestly I'd rather they just remade Thousand Year Door or the original. "Proper story" is nice but I really just don't like thing stickers. The sheer concept of not having them = death and having them = easy win just kills the fun to me. On top of which no badge or level up system? An engaging story is good but the way I see it there's still no reason to engage in fights that only waste color. I really don't get the lack of creativity, story wise. Instead of having Bowser be the bad guy AGAIN (I assume he will be in this), why not use other characters like Wario and Waluigi? Why is Nintendo so afraid to push the boat out? @Jeronan Luckily, Shigaru recently was interviewed and he said a lot of young new talent was hired that could possibly reevaluate some of the conventions of the Mario series' especially. When I look at this game or when anybody involved talks about it, I'm not filled with confidence. It's the complete opposite of anything to do with Zelda: BOTW. What does that tell you? But, at least the 'Thing' sticker are somewhat a Summon that we knew from Final Fantasy series. Well, didn't make very strong gameplay but fun to be watched. I still remember i ROFL when i saw some Hillarious Things such as Barber's Shear, Rubber Duckie, Accu Battery, Turkey , High Heel Shoes, etc. Completely insane as Tomodachi Life did. Very well done for me and quite strong enough to make me enjoy the games despite of Sticker system. I didn't even really care if less RPG or no. At least i have owned Fantasy Life, FF 3 NDS and next RPG game in my list, Ever Oasis. It's okay to play Color Splash. I've finished Sticker Star and no complaining at all despite of less RPG esque. I can guarantee Color Splash at least can capturing your heart. This was an okay game passed away a few hours hope the improvements are enough to lift this to A status. Seriously though, I got nothing. Nadal. Nope. NoTPC doing it anymore. I'm out. This place is just toxic and I'm not taking increasing pain at every turn. I think if they make enough improvements here and there, it may be really good. I wasn't a fan of Sticker Star, but I have hope for this one. I realize it's not supposed to be direct sequel to Super Mario RPG (Maybe one day....yeah sadly not). "This time we have–I don't know if I want to say a proper story–but we have a story"
Yeah, the toads holding YET ANOTHER fest! Sooooo original!! As far as ways to acknowledge criticism go, this sounds alarmingly generic. They could have pulled out all of the stops and delivered the game that most everyone wants as an amazing exclusive swansong for the Wii U. They could have done that. Paper Mario has one of the worst fanbases ever. i'm definitely getting this game. I was one of the few who loved Sticker Star and so did my kids. And we will enjoy this game too. I don't really play games for the story. I, more play for the joy of the game. "...how there will be a hint system in place to make it easier to figure out where to go and what to do next, hopefully to get around those issues in Sticker Star where progress was halted because you didn't have the right "Thing" sticker in your inventory." I would rather have them focus on designing areas that are intuitive and satisfying to play with no weird leaps in logic. By opting to just give players the answers with a hint system, they're arguably admitting they can't do that. They chose the best time to release color splash as they'll have nothing else to offer WiiU fans over the next six-or-more months so they'll probably buy it. Never played Sticker star, so I'm actually looking forward to playing this. When's the last time Nintendo made a Mario game that wasn't shovelware? No, I'm genuinely curious. I've never been a big Mario fan, and I still haven't played one I'd consider to be 'great'. "...in Sticker Star where progress was halted because you didn't have the right "Thing" sticker in your inventory." Not having the right sticker was the most frustrating thing about Sticker Star. After this happened to me about 3 times, I never went back. To be perfectly honest, I'm starting to think that Bowser WON'T be the baddy this time. Also, Nintendo basically corrected almost everything that went wrong with Sticker Star: EXP, Partner Cards, Looking For Thing Stickers, And Diverse Levels are big examples. What more does the Paper Mario fanbase want? One more thing, Sticker Star wasn't THAT bad, and if this is an improvement over Sticker Star, then what are people going crazy about? I think that this game looks fun and it's definitely very pretty. I've never played a Paper Mario game and wouldn't mind making this one my first. That being said, my backlog of games is huge, so I think I'll pass. @DCorp To be honest, seeing as how Bowser's seal tape and the Koopalings are in this game, I'm starting to think he is the main baddie in this game. I hope I am wrong, though. But yes, I feel like we're the only a few of the few who actually sees the improvements Color Splash makes over Sticker Star to the point that it is not Sticker Star 2.0, Sticker Star HD, Sticker Star whatever. It's just too gotdang ridiculous and absurd. ...well, even if Color Splash ends up being bad in the end, which I doubt, I'd much rather play that over Ultra Smash. I love the Mario franchise, but that...THAT was a bad game. @StephenYap3 I definitely agree about the Ultra Smash thing. But about Bowser being the bad guy? It just wouldn't make sense if it's this obvious, but Nintendo wants to keep it a secret. @DCorp I really don't Bowser to be the main baddie, I mean seeing as how this whole game is focused on paint, it really wouldn't make any sense for him to reappear as the main villain once more. Wasn't there a "Iwata asks" about Sticker Star where the team behind it admited that Miyamoto told them to stop creating new characters and only use the already existing classic ones? He also told them that the game didn't need a story. They are trying to get rid of the RPG elements and turn it into a gimmicky Mario platformer, but with "Paper Mario" as a character and painting cards for attacks. Here it is, right at the first question and answer on "Abandoning the RPG Structure"
I actually don't mind paper mario not being an rpg and being a "gimmicky platformer" I will say however that there are elements that drive me nuts... first and foremost THINGS. I hate things. I think they are stupid, abstract, obnoxious and horrible things. Hence things. I just don't think they fit and this is of course my opinion but in sticker star I remember there was an area where they had this giant area for a big thing sticker to go to try and melt the ice. There was a thing sticker that fit the shape/size and purpose. I don't remember what it was but I blew several hundred coins buying a bunch of these and sticking them, sticking them, sticking them only to look it up online and there was another sticker, completely ambiguous, different size, never would have guessed in 20 billion years that I was supposed to put it there. The thing stickers are terrible puzzles and horrible items. Stick to paper theme and mario theme elements. @Aerona I truly wish I could experience Thousand Year Door anew. That would be incredibly refreshing. You should definitely do it. Still looks like garbage to me. Oh well. I guess I have to say goodbye to Paper Mario since Nintendo wants to make it less of an RPG. Hopefully Mario & Luigi keeps its quality up. P.S. I never got to say this but I don't agree with the whole "If you want an RPG game, play Mario & Luigi." The two games are way more different than the developers think. Paper Mario 64's story is quite simple and ties it's story together nicely since the bosses are Bowser's Henchmen. But TTYD and SPM's overarcing stories...well to put it straight aren't good at all at they're often at odds(especially SPM) with the silly nature of the chapters AND they go on for far too long between chapters. The best writing and most memorable moments in TTYD and SPM have absolutely nothing to do with the main story except that you get a plot item at the end. If Color Splash can focus on lots of fun and clever writing in scenarios like they showed at E3 I'd be happier than if it had a story focus like TTYD or SPM. I don't want to beat a chapter of Color Splash and then be forced to read the villains stood in a single room spew out exposition for 20 minutes like SPM or suffer through another Peach - TEC style romance like TTYD. Though the fact the villain isn't displayed on game case and is a mystery is actually quite interesting in Color Splash, since when Bowser is the villain he usually appears within the first minutes of the game(PM64 and Sticker Star). Similarly Peach isn't kidnapped which is a first for the series as well. @abbyhitter I think I'm starting to notice that. I think reading the same complaints being hammered home over and over again has caused it to sink in ever so slightly. But nobody here works for Nintendo so it's all in vain really. In my opinion lol. I think it looks great, never dabbled with Paper Mario before so I'll keep an eye on this. There was no reason to depart from the formula of the first 2. If that means Paper Mario games being released less frequently, then so be it. I'm currently playing through Sticker Star and there is a really fun game hidden away somewhere in there, but too much of the original Paper Mario formula remains. The way I see it, SS is a lot like a point and click puzzle game with level based platforming and problem solving, and there's nothing wrong with that at all. As much as I truly love the older Paper Mario games I was even comfortable with this new slant on the franchise but by retaining the turn based combat and shoehorning stickers into that same combat system you get a fun game marred by repetitive, simplistic and unrewarding combat which ruins the pace of the core gameplay which is platforming and puzzle solving. Honestly, if the game took a more metroidvanian approach to upgrades and combat it would play much smoother and not clash with the level based design. Obviously most of us would have liked another RPG but Paper Mario had to potential to be a new type of puzzle platformer, but by trying to hold on too much to the old games, they ruined what could have been a solid new franchise. The graphics, dialogue and music are all top notch however and are a large part of what's keeping me playing. Hopefully Colour Splash can build on SS and become more of its own entity. I am up for playing this game looks good and the story could be fun also. @Bobb Yea, that was in an interview with Miyamoto. However, I feel that was kind of a mask for Nintendo's initiative to unify the Mario brand. They think they can sell more games if they strip side games down to core Mario elements seen in their blockbuster main series. If this could only be Sticker Star done right, I would respect it a lot more. Using Thing Stickers to progress, however, is stupid- hints or no hints. Sticker Star's bosses were just glorified thing puzzles. And exp is DEFINITELY necessary. Is that the Mario Sunshine logo in the back of that photo!? Instant buy. Nintendo needs to do a licensing deal with Square Enix to make SMRPG2: Smithy's Revenge. Make it have 3D World like graphics, only with a full 360 camera. Now that would sell. @Boidoh Yes... Yes it is!!!!! @Bobb That has to be one of the most bizarre and overreaching things Miyamoto has done. The various Mario RPGs have thrived from the new, unique characters introduced through them, and to ban any and all new characters is to kill the series. If Nintendo has really learned its lesson from Sticker Star, they would do a complete 180 away from the sticker/card format and go back to the traditional RPG formula. As it appears, they intend to turn the Paper Mario series into a cookie cutter like the New Super Mario Bros. series, which is very disappointing. @copeland4 You may be right. The following statement is not aimed at you or your opinion, just some words I wished to share. I have a feeling THIS is what they want for the Paper Mario series from here on. We can see here in the comments: there are people who enjoy these new games. Me, personally? I consider myself a big fan of the first 3 Paper Mario games (Yeah, Super wasn't that bad in my opinion, though the first 2 were far more fun), and I was quite disapointed with Sticker Star. I'm sure Color Splash is not one I would enjoy. I mentioned it in a previous article (once again, only my opinion). Nintendo has the right to do whatever they wish with their IP. Unless they really want to go back on what Mr. Miyamoto said during SS development, it is not going to be the old games we grew with, no matter what the fans say. They showed us they want to improve over SS, that is it. SS is their starting point. Just remember the world takes turns. Mario games were platformers, that went full 3D adventure, to RPGs, to all this and that. If I could leave an advice to anyone willing to listen: either enjoy this game or leave it to other who will. I'm sure there are a lot of other games that are going be more to your liking. I'm going to do just that, even if deep down I wished for a new Paper Mario RPG. I think the development of this game shows a little arrogance on the part of Nintendo. According to the E3 Treehouse stuff development on this game began right after Sticker Star finished, so they would have had no idea just what kind of reception it would receive. My only reasoning is that they believed with Miyamoto helming Sticker Star that it was going to be a guaranteed success and wanted to ride that assurance into a sequel. Those enemy cards in the game are the biggest insult in general as someone who enjoys good characterization and narrative structure. There are some of ardent defenders of Sticker Star, but the reception on the Color Splash YouTube videos is heavily in favor of dislike. Even a 20/80 like to dislike ratio on a Nintendo trailer is troubling, and come release-time, companies love to bulletpoint their releases with big review sites giving them high ratings. (IGN: 9.5/10 "Masterful", Engaget: 9.0, "A real treat.") The reception of this game, and the other strange releases as of late (Federation Force, that Animal Crossing board game) will probably be the sobering reminder that they need to consider fan feedback sometimes. The Zelda team took the feedback from Skyward Sword, and has since been releasing very well-received games! The entire "Oh, we already have M&L so we obvs don't need another rpg spin-off" makes sense. They are spin-offs so one series per genre should be enough and while I'd argue you can have two spin-offs of the same genre, one exclusive to handhelds and the other limited to consoles (just as it was back in the early days of both series) having PM be a action adventure like Super Paper Mario would be fine by me. SPM was a great game as it, unlike Sticker Star and most likely Color Splash, retained the wacky characters, story and humor of the original two installments which imo defines the series more than its gameplay. However, I must say that I am very unhappy with both Mario&Luigi and Paper Mario. Ever since Bowser's Inside Story, we have wandered through pretty much the same forest/plains, desert, ice, beach and so on levels. No unique story, no unique characters (I don't mean newly introduced but rather characters defined by their personality and humanity and not just Toads, Toads everywhere). I think it started with Dream Team where Miyamoto realized that Bowser wasn't protrayed the way he wanted him to be so now Bowser has ALWAYS to be the villain instead of somebody more surprising (considering they have pretty much a murder mystery here) or interesting like Count Bleck. Finally, I wanna be perfectly honest here: I play rpgs for the story and its characters alone. Sure, Paper Mario has never boasted with a complex story as FF7 or KH and I was mostly there because it's Mario and for the humor of the game's characters but the recent development of both Mario rpg series saddens me to the point of boycotting Color Splash. This article ignores the most important part of the interview. You are just picking the sweet side. Nintendo also said that they are following the Sticker Star "light RPG" style because they believe there's RPG in Mario & Luigi already. Basically, they are saying Paper Mario is going to be an action adventure from now on, with cards instead of a team and with a deeper story than Sticker Star's story which was ridiculous anyway. @Snow-Dust Miyamoto has a bizarre phobia of storytelling. It's one of the few bad things I can say about him. @GoldenGamer88 It's like you read my mind. I suppose this Huey character is the only hope we have for this game. I question how deep a relationship can be carried by Mario the speechless, but Thousand Year Door found a way to have Goombella and Vivian work off of Mario very well, so maybe Huey will surprise us.